Before OneCoin collapsed, Konstantin Ignatov is believed to have worked as personal bodyguard for his sister, Ruja Ignatov. Ruja Ignatov was the public face of OneCoin, while Ignatov lurked in the shadows. Following Ignatova going into hiding on or around mid 2017, Konstantin was thrust into the spotlight. Awkward on stage and poorly groomed for the role, over the past two years or so Konstantin has struggled to present himself as a credible CEO. Central to Konstantin’s image problem was the fact that by the time he took over, OneCoin was clearly a Ponzi past its prime. Adding to that, Konstantin has also now been arrested and criminally charged in the US. Konstantin traveled from Istanbul, Turkey, on February 27th. We don’t know exactly what Konstantin was up to in the US, but he is believed to have been travelling locally on OneCoin related business. On March 6th Konstantin was scheduled to fly back to Bulgaria. As he attempted to board his plane however, US authorities arrested Ignatov at the Los Angeles International Airport. A sealed complaint filed by the DOJ reveals they were working with the FBI, who are believed to have executed Ignatov’s arrest. analyzed “various bank account records”. According to the DOJ’s complaint, Konstantin is currently “the top leader” of OneCoin. The DOJ state their investigation into OneCoin ‘has revealed (it) is in fact a fraudulent scheme‘. During its prime (late 2014 to late 2017), the DOJ allege OneCoin solicited €3.3 billion EUR from investors ($3.7 billion USD). As per the DOJ’s complaint, here are the details of their investigation pertaining to Konstantin’s various roles within OneCoin. Konstantin Ignatov is the brother of Ruja Ignatova, OneCoin’s founder, and top leader until her disappearance from public view, in or about October 2017. Starting in late 2017, Ignatov assumed high-level positions at OneCoin, rising to the top leadership position in mid-2018. The investigation has revealed that before ascending to OneCoin leadership in late 2017, Ignatov served as Ruja’s personal assistant. In that role, Ignatov scheduled appointments, made travel arrangements, and managed a personal calendar for Ruja, among other significant responsibilities. Since December 2017, Konstantin Ignatov has functioned as a high-level executive, promoter, and spokesperson for the OneCoin organization, appearing at OneCoin-OneLife events worldwide, including Thailand, Singapore, Colombia, Argentina, Brazil, Paraguay, Bulgaria, France, and Spain. The investigation has revealed that in this role, Ignatov has made fraudulent representations to investors about OneCoin’s structure, value, usability, and future public offering. Covered in gang tattoos and rumored to have links to the Bulgarian mafia, Konstantin (right) did his best to present himself as a warm competent leader. Behind the scenes however, Konstantin ruled OneCoin with an iron fist. In response to a BMW auctioned off at a 2018 OneLife event in Romania for 3.6 million OneCoin points, investors expressed concern over the true value of OneCoin points. The recent auction was poorly planned and very very chaotic. This led to a lot of complaints and the value and the value of the coin, because of what was paid, was questioned. Really, I will tell you something. This will be worse than you ever experienced. I really want and will have in future an eye on everything, and if somebody messes up something like this, there will be very hard consequences. 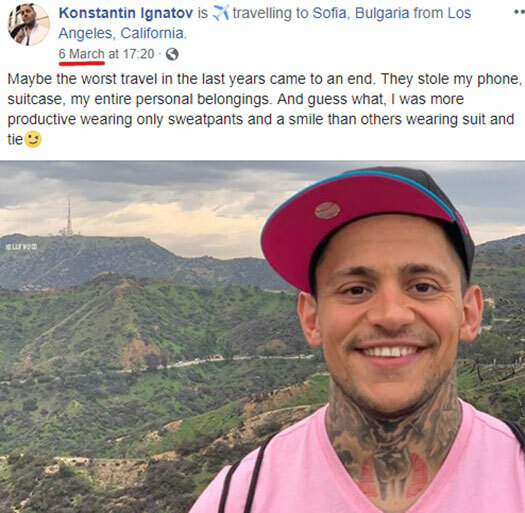 In a Facebook post made hours before his arrest, Konstantin lamented his trip to the US as “the worst travel in the last years”. What Konstantin failed to mention in the above post, was that “they” who “stole” his belongings were in actuality US law enforcement. Upon arrival at San Francisco International Airport on February 27th, Customs and Border Protection ‘referred Iganatov to a secondary baggage exam‘. During his interrogation, Ignatov told Customs and Border Protection he was “trained in mixed martial arts” and in the US because he “planned to train” with a friend in Las Vegas. As to his employment, Ignatov stated he was “self-employed for the last two years as a public speaker”. Ignatov did not mention OneCoin or OneLife by name, but stated he gave ‘seminars on financial events and personality development‘. Customs and Border Protection analyzed a laptop and cell phone in Ignatov’s possession. from law enforcement agents the fact that he runs OneCoin, and was visiting Las Vegas, at least in part, to attend a OneCoin event. A search and seizure warrant was sought on March 3rd and following approval, executed. Further review of Ignatov’s seized assets revealed the true nature of his trip. 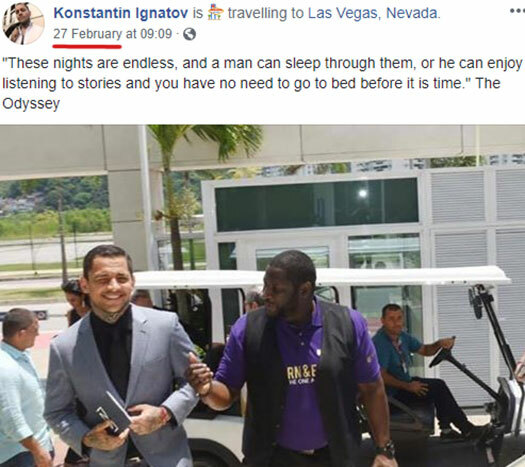 The trip taken by Konstantin Ignatov to Las Vegas appears to have been a planned business trip in which he conducted business on behalf of OneCoin. 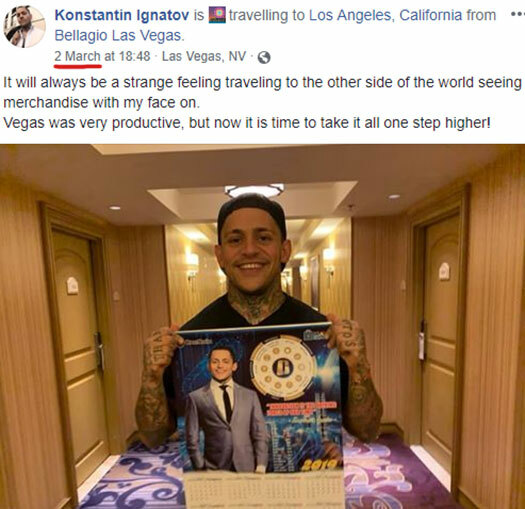 In the lead up to Ignatov’s trip to Las Vegas, Ignatov discussed the logistics of the upcoming trip with a OneCoin affiliate (OneCoin Affiliate-1). “in Las Vegas, 14:00 – 18:00h .. at least 20+ top selected leaders ([from many]) cities in USA) there for the meeting/DS training and love to have you with us 30-60 minutes. Will be inside our Bellagio Hotel-Suite or Pen[t]house. “send you again the proposed meeting schedule for next 02 days. Over the following days, social media also betrayed Ignatov’s lies to Customers and Border Protection. On or about March 5, 2019, Ignatov posted a photo of himself in front of a sign that appears to be in Las Vegas on his Instagram page. In a comment on that Instagram post, Ignatov wrote, “[I] am here for work reasons not holiday,” contradicting statements made to law enforcement agents at SFO. Between on or about March 1, 2019, and March 3, 2019, three videos were posted on YouTube that all appear to be from a OneCoin promotion/networking event that took place in Las Vegas Nevada. The video above features Konstantin meeting with OneCoin Black, Blue and Diamond leaders, as well as an employee of DealShaker and “a president at DealShaker”. The stated purpose of the meeting was to discuss “dealshaker development in (the) USA”. Other videos show Ignatov promoting OneCoin at the event and posing with affiliates in attendance. The rest is history. Ignatov was arrested attempting to leave the US on March 6th. Based on collected evidence, thus far Ignatov has been charged with one count of conspiracy to commit wire fraud.